By the low standards of baseball, Indians starting pitcher Mike Clevinger is an interesting personality. He loves good vibes, has a flowery tattoo sleeve on his left arm, and frequently wears customized cleats, even if that means pushing back on MLB’s dour uniform rules. 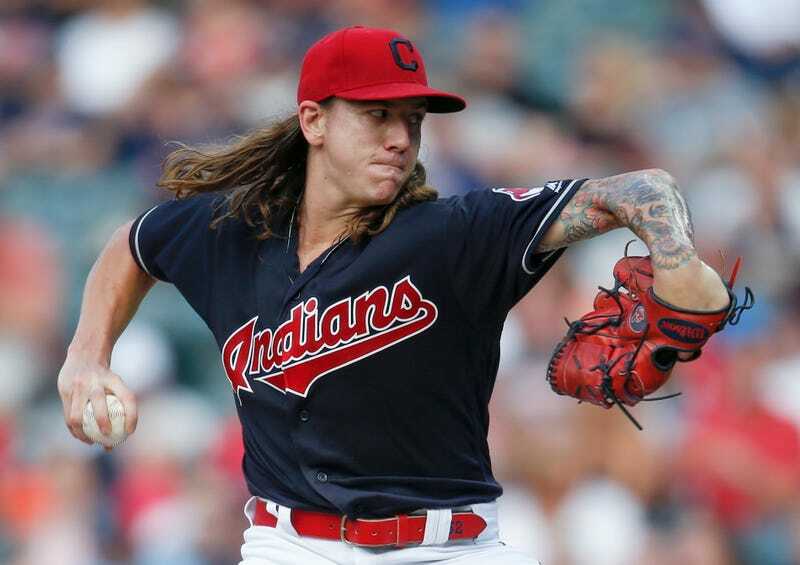 Clevinger also has long hair, which means he’s replaced Tim Lincecum as the go-to baseball comparison to Dazed and Confused’s Mitch Kramer, but don’t tell him if you have a problem with his locks. On a harmless video of Clevinger’s postgame presser yesterday with his daughter—she was far more interested in a lollipop than his six shutout innings in an 8-0 win over the Orioles—one Cleveland fan told the pitcher to chop off his hair. Clevinger eventually deleted his response. Telling a baseball player to cut his hair definitely makes someone an out-of-touch honky, but it’s hard to see how it makes them a possible Nazi. Clevinger should continue to pitch like his teammate Trevor Bauer, but perhaps not tweet as much as him.